A person might ask why writing this post made me cry (it did), when, after high school, I fell out of touch with my living uncles and aunts. Perhaps with this uncle I imagine a relationship in which my reckless and sultry late adolescent personality didn’t get in the way? More than that, though, I ache for this young man of a generation born at the wrong time, with Hitler who had to be stopped, the last war, in my opinion, that the U.S. should have fought. I was born in 1948. My father’s brother Noel Clarence McCann was a glider pilot shot down over the Netherlands during Operation Market Garden, on 18 Sept. 1944. His glider crashed near the village of Oisterwijk, Netherlands, killing all four aboard. He was from Cincinnati, “The Queen City,” and his wife’s name was Clara. Noel was serving in Baker Company, 326th Airborne Engineering Battalion (his ID Nr. T122016). That Battalion was awarded the French Croix de Guerre, the Netherlands Orange Lanyard and the Belgian Fourragere for its bravery during the war. 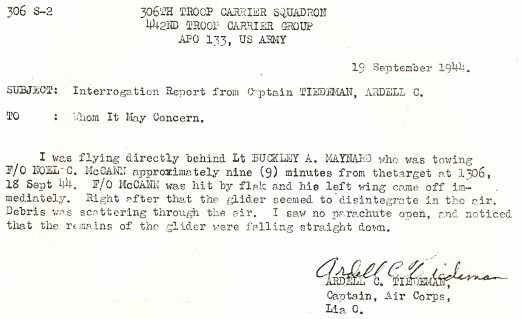 The casualty rate among glider pilots was among the highest of any combat specialty in WW II. The glider was carrying supplies, including a Jeep. The Jeep may or may not have survived the crash, been appropriated by the Nazis and then continued in use locally in Oisterwijk after the war. Noel was first buried in a chapel graveyard near Oisterwijk, then moved to the American cemetery in Margraten, Netherlands, then repatriated to Kentucky. There is a plaque with the names of all four men in Holy Mary chapel, near Oisterwijk. The plane he piloted was a WACO CG-4a glider. It crashed when flak from German fire destroyed the left wing. He is buried in Evergreen Cemetery in Southgate, KY. He is survived today, I believe, by a granddaughter or great granddaughter living in Ohio. 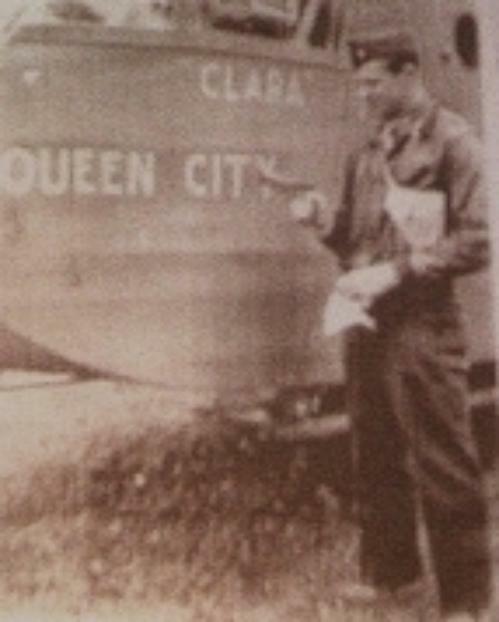 Piloting the “Queen City” was Flight Officer Noel McCann of Norwood, Ohio, a suburb of Cincinnati. In the co-pilot seat was Lt. Ray Hiltunen of Baker Company, 326th AEB. An eye witness to their downing was FIO George Anderson who lives today in Herkimer, NY, who watched helplessly as his best friend, Noel McCann, was killed when the glider crashed. There was no time to mourn as he had to land a glider containing soldiers and supplies. To the right [above in this post] is McCann next to his aircraft with his wife’s name above the nickname and the grave in Holland in 1945. Later the family would have has body returned to his home state of Kentucky. Below, the final resting place for Lt. Hiltunen. Place of Death “Over Holland” : the record below, from Evergreen Cemetery where Noel was re-interred in 1949, is from http://www.rootsweb.ancestry.com/~kycampbe/evergreenMc.htm. This entry was posted in autobiographical memory, Memorial Day, World War II and tagged Noel Clarence McCann, Operation Market Garden, WWII glider pilots. Bookmark the permalink.